The September meeting marked a turning point in the Riksbank’s policy stance. Policy-makers appear to have returned from their summer holidays in a rather sunnier mood, and now seem more determined to raise interest rates within the next six month. While further delays can't be excluded, we think they're likely to follow through this time, even if the Swedish economy continues to slow down and underlying inflation remains soft. While the interest rate forecast published in September was revised down slightly to remove the potential for a hike in October, the policy statement explicitly indicates a 25bps hike in December or February. This is the first time in the current cycle the Riksbank has mentioned hiking rates at specific meetings, which suggests a stronger commitment to deliver on this forecast. The minutes published last week and recent speeches from Governor Stefan Ingves, Deputy Governor Kerstin af Jochnick, and Deputy Governor Per Jansson also suggest a shift in stance. From the minutes, it seems clear that by December three members - Henry Ohlsson, Martin Floden, and Cecilia Skingsley are likely to be voting for higher interest rates. 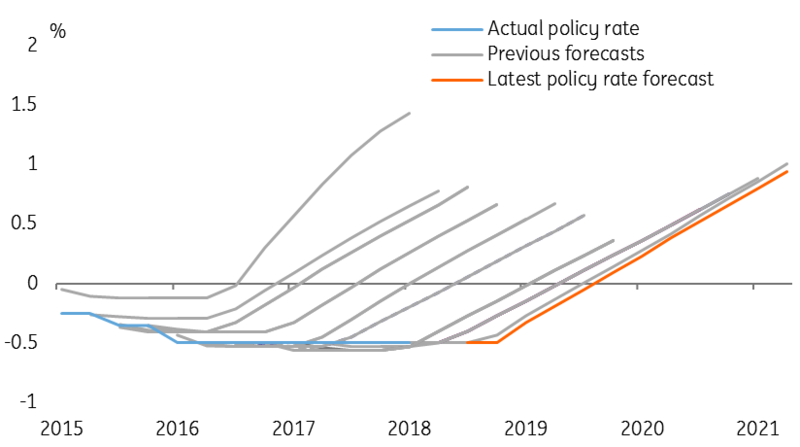 But more importantly, the dovish majority (Ingves, Af Jochnick, and Jansson) all signalled clearly that they expect to increase the policy rate by February, and have reinforced that message over the past week. Earlier in the year, the three dovish members appeared hyper-sensitive to repeated downside surprises in core inflation (seven out of eight inflation figures have been below the Riksbank’s forecast this year). But despite this pattern continuing over the summer, all three now appear more optimistic about the outlook for inflation. Even ultra-dovish Jansson appeared content that inflation is likely to stabilise around the target and that rates can now rise. We interpret this new stance as meaning that further moderate undershooting of the forecasts would not be enough to delay interest rate rises further and that so long as the economy evolves broadly in line with the current forecast, the Riksbank is likely to follow through. This is also what Ingves and Af Jochnick implied in comments to the press, where they downplayed the GDP downgrade and suggested small misses in inflation forecasts were no big deal. Soft inflation and growth data (we expect growth and inflation over the autumn to continue to come in a bit below the Riksbank’s forecast) will probably shift the balance of the committee towards February rather than December. But we now believe it would take a more material change in the outlook – something like a sharp slowdown in Sweden (perhaps driven by the weakening housing market) or a worsening of the global environment (whether from the US-China trade war, Italy’s fiscal situation, or emerging market woes) – to push the rate hike further out. This has forced us to revise our view of the likely path of Riksbank policy. We now see a 25bps hike in either December or February as likely, with December the less likely option. A further delay into April or even later is still possible if there is a material worsening of the outlook in Sweden or abroad, but this is not our central expectation. That said, we don’t believe the Riksbank has changed its outlook dramatically. It remains one of the most dovish central banks out there and will continue to approach policy tightening with extreme caution. That is why we think a hike in February is more likely than December, and still see some chance of another delay into mid-2019. We also expect the Riksbank will seek to soften the first hike by combining it with a lower rate path (as Norges Bank did this week). This will most likely reduce the total tightening signalled by end 2019 from the current three hikes to two, with another two pencilled in for 2020. Another possibility is announcing that reinvestments of QE purchases will continue beyond the current end-date in mid-2019. An announcement on future reinvestment policy is due by the April 2019 meeting but could be made earlier. Though the impact of reinvestments is marginal, extending them would nevertheless reinforce the Riksbank’s dovish bias. 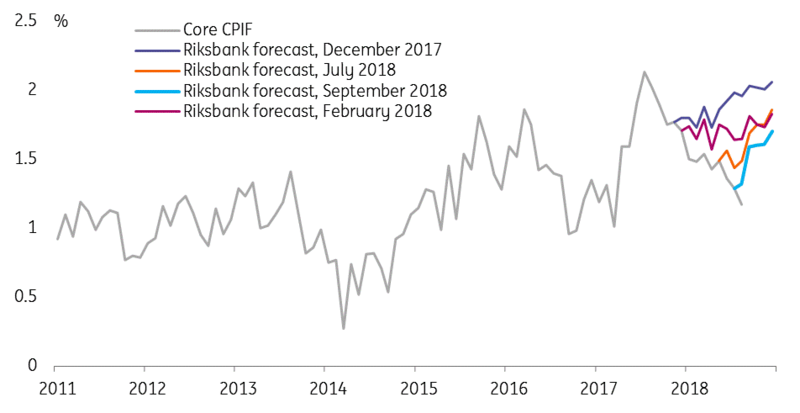 Riksbank interest forecasts. is this time different? The risks to this profile are skewed downwards, given the Riksbank’s bias and the potential for their forecast to (again) prove overly optimistic. The key factor for us is the asymmetric reaction function that we attribute to Governor Ingves and the doves: they are happy to tolerate – and may even welcome – inflation modestly overshooting the 2% target, but believe inflation below target as risking a relapse towards weakened inflation expectations. Similarly, they still worry about a rapid appreciation of the krona, and would likely respond to sustained SEK strength, but have been very relaxed about the ~10% depreciation over the past year. Also, the Riksbank will factor in high household indebtedness and the economy’s consequent exposure to rising interest rates. Swedes are deeper in debt than ever before, and because most mortgages are floating rate or short-term fixed rate the pass-through to consumer demand will likely be fairly direct. This means households are more sensitive to higher interest rates than in previous cycles, and raising interest rates too fast risks damaging household demand. This will be a constraint on the Riksbank for the foreseeable future, and in our view means that the Riksbank is unlikely to tighten faster than two hikes per year.